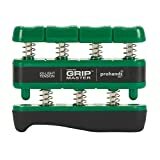 The patented Gripmaster is the only hand exerciser in the world that exercises each finger individually for optimum conditioning of the hand, wrist and forearm. 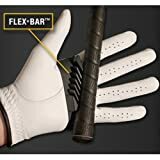 The Women's Classic Bionic Golf Gloves is not just a smaller size, the Bionic gloves are designed to fit the anatomical specifications of female hands. 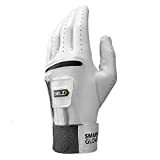 These gloves allow you to maximize your game by giving your hands top of the line comfort and increasing club control. 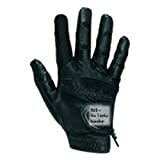 The Bionic Stable Grip Men's Golf Glove in all-black leather shows less dirt, keeping the glove looking new longer. Strategically placed pads in the fingers and palm even out the surface of your hand for a lighter, more relaxed grip while enhancing durability--2X more durability in areas prone to wear and tear. The patented pre-rotated finger design complements natural closure of the hand and helps reduce fatigue. Lycra motion and web zones provide better range of motion and a more comfortable fit. Bionic gloves are the only gloves designed by a hand specialist with patented pad technology. Gripmaster is the original spring-loaded finger piston system. Daily use conditions and rehabs the hands, wrists and forearms by flexing and toning the muscles, ligaments and tendons. Use each button independently to exercise fingers or compress the entire unit for complete hand and forearm strengthening. The flexible latex-free ergonomic base conforms to the users palm, cushions impact and significantly increases attainable range of motion. Progressive color-coded resistance gives users positive feedback. Comes with exercise program developed by a licensed hand therapist. 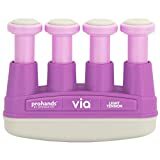 The patented VIA strengthens and conditions your hands, wrists and forearms. Soft finger pads and palm rest, along with an ergonomic design, make VIA the most comfortable hand exerciser available today. Preformed training grip fits onto any club in just seconds. Makes it easy for a beginner to pick up the club right the first time. Guides your hands into exact placement in seconds. The Extreme Pro Gyro can reach up to 9,000 RPM and creates 25lbs of torque resistance to increase grip strength, increase range of motion, and to condition arm, elbow, and shoulder muscles. The gyros also aid in the rehabilitation and prevention of Carpal Tunnel and injuries to fingers, hands, wrists, forearms, elbows, biceps and shoulders.